The Cinque Terre Card.. is it truly worthy? The Cinque Terre National Park, established in 1999, has set-up a fee for the usage of path number 2 Riomaggiore-Monterosso. This with the objective to collect funds necessary for the maintenance of the paths, which are often damaged by landslides. To date ( May 2015) however, the situation is not good, particularly due to the closure of part of the path #2, including the “Via dell’Amore” which is open only for a short part from Manarola. It’a widely shared opinion that the economical resources coming as revenues from the “5 Terre card” ARE NOT used in the best way on the territory for its maintenance and the solution of its critical issues. Unlimited travel in both directions, on second class local trains, between the stations of La Spezia and Levanto. – Ask for precise and detailed information at the info offices ( loated by the train stations of the towns) before to buy the card. – If you intend to visit the 5 Terre by train and you consider to buy the card for this scope, have in mind that to cover the cost of 12 euros you mus take at least 6 trains in a day! which is a very rare situation. – There’re dozens of wonderful paths on which the TREKKING CARD does’nt apply AND SO THE’RE COMPLETELY FREE. 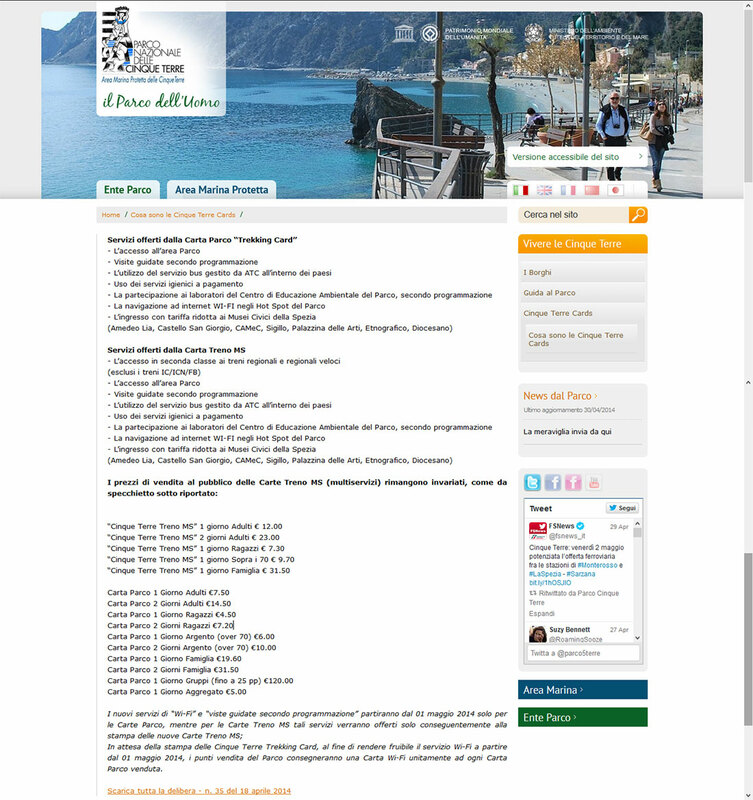 You may ask to local guides authorized at trekking Cinque Terre and to the local shops and restaurants. – For those who want to lighten the route possible bus Manarola- Volastra Eur 1.50. In case of bad weather or in case of maintenance, parts of the paths can be clodes, so ask for information on the practicability beofre to purchase the card. To date (may 2015), the blue path is closed between Riomaggiore and Vernazza due to various landslides that severely damaged the path. I’m planning to train from La Spezia to Monterosso and visit each of the remaining villages and return to La Spezia on the same day. I’m thinking of purchasing CT Card Multiservice ahead of time before arriving in La Spezia? If doable, which website to buy it online, can anyone help? Thank you so much for the info!! Very helpful for visitors with a budget!! Especially students! Är den gamla leden mellan Riogiomario och Manarola öppen. Skall guida en grupp från Sverige på ca 30 personer. Jag vill veta om det går att nå Manarola över bergen på den ganla stigen.